The following general troubleshooting tips may be useful for certain issues. Although it is possible to create topics or snippets that contain a great deal of content, it is recommended that you try to keep files sizes to a minimum. Try to break the content up and place it into multiple topics or snippets, rather than putting it all into one very long file. The more content that a file contains—especially pictures and multimedia—the longer it takes to load it. 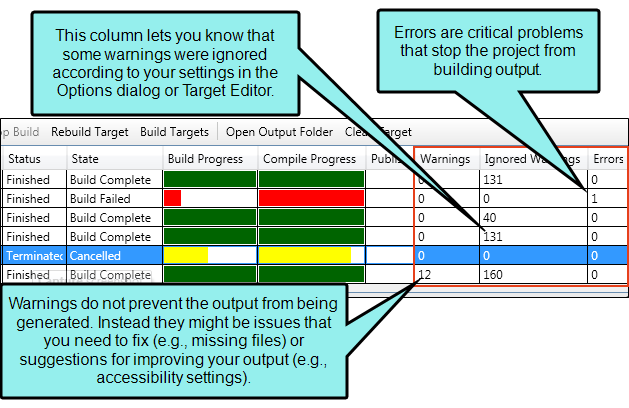 If you generate a target with warnings or errors, they are displayed in the Builds window pane. Warnings do not prevent the output from being generated. Instead they might be issues that you need to fix (e.g., missing files) or suggestions for improving your output (e.g., accessibility settings). Errors are critical problems that stop the project from building output. In the Builds window pane, click Open Build Log in the local toolbar to open this file so that you can review and address any issues. If necessary, you can click the tab at the top of the Log File window and drag down to float it. Then you can maximize the window to see as much information as possible. The Warnings grid contains several columns. The Description column shows the problem, and for certain types of problems the file at the center of the issue is also included. If you scroll to the right, you will see the File column, which shows the file where the issue occurs. If you double-click the row, the file opens where the problem occurs. Although you can have multiple files open in Flare's interface at the same time, it's not a good idea to keep too many of them open. This goes for window panes too. If you have 35 files open, as well as a dozen window panes, Flare's processing performance may suffer. You will especially notice Flare taking longer to load all of these files and window panes if you previously closed the application with all of them still open. Flare remembers what you had open when you closed, so it has to take the time to re-open them all again. One handy feature to quickly close many files at once can be found in Windows > Close All Documents or Close All But This (i.e., close all files except the one that currently has focus). Sometimes you might experience a problem where it seems particularly difficult to locate the source of the issue. This is particularly true when you have a build error that prevents a target from finishing the compilation process. One way to discover the precise location of the problem is remove files until you no longer have the issue. Before you remove anything from your project, first make a copy of it. In Windows, open the folder where the backup project is stored. Delete several files. However, do not remove the few files that are absolutely necessary to open the project and generate the target. This includes the main FLPRJ project file and the target file itself. But otherwise, try deleting many of your content files. Open the backup project in Flare and try generating the target again. You will probably see several warnings in the Builds window pane due to the files you removed. Don't worry about those. You are only concerned about seeing the error that you saw previously. If you experience the same error again, repeat these steps until it does not occur. Then you can put some of the deleted files back into the folder and try again until you narrow the issue down to a specific file. Even then, you may need to then remove content from the problem file and try generating again until you discover the source of the problem.